People grow fat because of technology ~ Engineering projects ideas for final year students & paper presentations collection blog. Now will you believe me if am going to tell you that yes, people grow fat with growing technology!?! Feeling that am linking two really unrelated things? Fine let me try to convince you with all the points that I have! 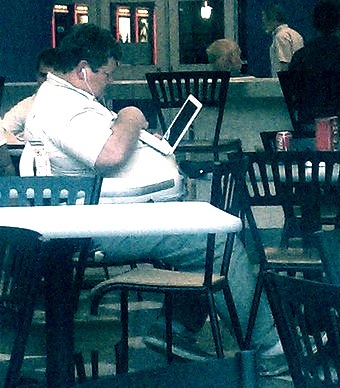 It’s now statistically proven that people grow fat with growing technology. According to The Milken institute, an economic thinking tank, about a 10% increase in information and communication technology (ICT) can increase the American population by 1.4% more people wearing shape wears, which can be approximated to around 4.2 million people! The main factor is the “knowledge-based society” states The Milliken institute according to its survey and adds up “more processed food, spending enormous time in front of screens (TV, computers or playing video games etc. ), which of course obviously leads to decreased energy usage, and last but not the least eating of junk foods”. Let me give you a small visual statistics which proves this issue. Round the globe the obesity rates have up surged higher than the population’s blood sugar. Placing the key Asian countries in the bars shown below is the graph visualizing the growing rate of obesity in a short period of around 6 to 11 years with the era of rise in technology. Starting with japan, it has an increase of 1.5times more from 2.2 to 3.9 for a period of 8 years span. South Korea is alike japan with 1.7times rise from 2.2 to 3.8 but in period of 11 years. China and India are the worst victims for this. While china has doubled from 2.5 to 5.7, India has almost tripled from 0.7 to 1.9! Now don’t even think in dream from seeing the chart that America is going to be an exception for this case. They have a rate of 33.3% increase in obesity beating all the countries shown above! For the past 2 decades the calories consumption per day has increased to 150-300 calories in U.S. There are many ways to reduce this obesity like simple walking everyday can save your life from death sometimes! Around 2.8 million adults die due to these obesity or weight related diseases. It accounts to for around $147 billion for medical cost! So it’s high time for us to realize and be conscious about our diet and health and keep an eye on our country’s obesity rates!